Few players are good enough to play for either Australia or New Zealand. Even fewer are good enough to play for both. Des Connor was an exception in that regard. Connor was born in Brisbane and after taking up the game at the Marist Brothers College at Ashgrove before honing his skills further with the Brothers club, he was called into the Wallabies squad for the 1957-58 tour of Great Britain and France. A dynamic and quick-thinking scrum-half, Connor quickly made the number nine jersey his own and featured in all five internationals on the trip. He even captained Australia against the New Zealand Maori later in the year. 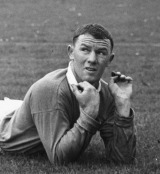 He faced the Lions in 1959 but at the start of the 1960s he began to ponder a move overseas to further his career as a teacher. He appeared set to head for Great Britain but was ultimately persuaded to make the far shorter journey to New Zealand. By 1961, he was lining out for the All Blacks after qualifying for selection under the rather relaxed residency rules of the time. Connor toured Australia with the All Blacks the following year and eventually went on to win 12 caps for his adopted country. However, he was to return to Australia as a coach and led the Wallabies out in their home series against New Zealand in 1968. He also oversaw tours to South Africa in 1969 and 1971 before eventually stepping down.